A delicious Scottish breakfast treat, these Haggis, Neeps and Tatties Pancakes are the ideal way to kick off your Burns Supper celebrations. But they are far too good to save just for breakfast or just for Burns Night. Haggis is for life - not just the 25th of January. You can find McIntosh of Strathmore Haggis Neeps and Tatties ready meals all year round in the chiller cabinets of Scottish supermarkets, however in the lead up to Burns Night 2018 they'll be resplendent in limited edition promotional 'Poetry In A Pack' branding. In addition to the single serving "Wee Burns Supper" packs in both traditional and vegetarian variants, there's also a large pack which is perfect for sharing. All the meals can be cooked in either a conventional oven or microwaved and will let you enjoy Burns without the hassle of peeling, chopping, mashing and boiling! There's really no excuse not to celebrate with your very own Burns Supper whether as as individual or family and everyone can be kept happy with the equally delicious vegetarian option. Celebrate Burns with McIntosh and you'll have pretty much everything you need for a traditional Burns Supper in minutes! Just add whisky and you're all set. 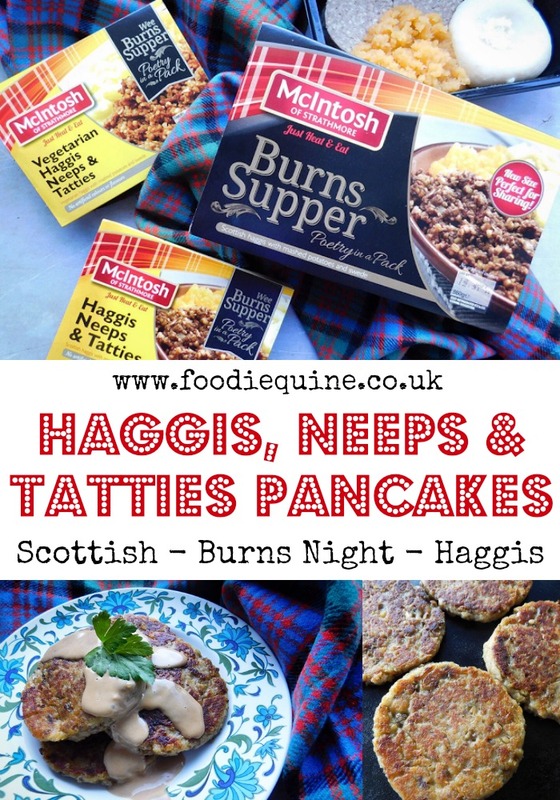 If you fancy doing something a wee bit different with your ready meal how about my Haggis, Neeps and Tatties Pancakes? I reckon they would make the perfect breakfast come 25th January but perhaps hold off on the whisky at such an early hour (although I did serve mine with a whisky cream sauce...!) You could even make blini sized ones and top them with Scottish Smoked Salmon for Burns Supper Canapes. No matter how you celebrate be sure to share your snaps on social media using the #BurnsWithMcIntosh hashtag and checkout the selection of Quick Burns Facts to impress or quiz your guests. Tip the contents of your ready meal into a bowl and combine it all together with a fork or potato masher. Add the flour and beaten egg and mix thoroughly. Shallow fry four at a time in a splash of Scottish Rapessed Oil. They'll need approximately 5-8 minutes on each side to ensure they are warmed through with a crispy golden exterior. Sae let the Lord be Thanket! OH wow these look delicious!!!! I think I'm going to have to give them a try as I love substantial things like that for a weekend breakfast. They would make an ideal addition to a Full Scottish Breakfast on any day of the year. It's a great time of year and Haggis something I'm so new to enjoying. I think this is the next thing to try on my haggis journey. I love the idea of a Haggis journey and the fact that a ready meal can help along the way. Such a clever idea, and a low fuss way to enjoy a Burn's Night supper. Perfect for families short on time, but who still want something a but special to celebrate. Aboslutely! Burns without the chopping, boiling and mashing. I've never seen a recipe quite like this but I do love haggis and would love to try this. It sounds like a great brunch or even dinner recipe. They could definately work in all sorts of edible situations, and not just for Burns Night celebrations.